As of 2018, the Recording Industry Association of America (RIAA) credits Presley with 146.5 million certified album sales in the U.S., third all time behind the Beatles and Garth Brooks. He holds the records for most gold albums (117, more than twice as many as second-place Barbra Streisand's 51), most platinum albums (67), and most multi-platinum albums (27). His total of 197 album certification awards (including one diamond award), far outpaces the Beatles' second-best 122. He has the most gold singles (54) and the fourth-most platinum singles (27, behind Rihanna, Taylor Swift, and Chris Brown). Since the beginning of his career, Elvis Presley has had an extensive cultural impact. According to Rolling Stone, "it was Elvis who made rock 'n' roll the international language of pop." Rolling Stone encyclopedia of Rock and Roll describes Presley as "an American music giant of the 20th century who single-handedly changed the course of music and culture in the mid-1950s." His recordings, dance moves, attitude and clothing came to be seen as embodiments of rock and roll. His music was heavily influenced by African-American blues, Christian gospel, and Southern country. In a list of the greatest English language singers, as compiled by Q Magazine, Presley was ranked first, and second in the list of greatest singers of 20th century by BBC Radio. Some people claim that Presley created a whole new style of music, "it wasn't black, wasn't white, wasn't pop or wasn't country- it was different". He gave teens music to grow up with and listen to, as most singers in his time created music geared for adults. Presley sang both hard driving rockabilly, rock and roll dance songs and ballads, laying a commercial foundation upon which other rock musicians would build their careers. African-American performers like Big Joe Turner, Wynonie Harris and Fats Domino came to national prominence after Presley's acceptance among mass audiences of White American adults. Singers like Jerry Lee Lewis, the Everly Brothers, Chuck Berry, Bo Diddley, Little Richard, Buddy Holly, Johnny Cash, Roy Orbison and others immediately followed in his wake. John Lennon later observed, "Before Elvis, there was nothing. "During the post-WWII economic boom of the 1950s, many parents were able to give their teenage children much higher weekly allowances, signaling a shift in the buying power and purchasing habits of American teens. During the 1940s bobby soxers had idolized Frank Sinatra, but the buyers of his records were mostly between the ages of eighteen and twenty-two. Presley triggered a lot of demand for his records by near-teens and early teens aged ten and up. Along with Presley's "ducktail" haircut, the demand for black slacks and loose, open-necked shirts resulted in new lines of clothing for teenage boys whereas a girl might get a pink portable 45 rpm record player for her bedroom. Meanwhile, American teenagers began buying newly available portable transistor radios and listened to rock 'n' roll on them (helping to propel that fledgling industry from an estimated 100,000 units sold in 1955 to 5,000,000 units by the end of 1958). Teens were asserting more independence and Presley became a national symbol of their parents' consternation. Elvis Presley (released in the UK as Elvis Presley Rock n' Roll) is the debut studio album by American rock and roll singer Elvis Presley. The album was released by RCA Victor, catalog number LPM-1254, in March 1956. The recording sessions took place on January 10 and January 11 at the RCA Victor recording studios in Nashville, Tennessee, and on January 30 and January 31 at the RCA Victor studios in New York. Additional recordings originated from sessions at Sun Studio in Memphis, Tennessee, on July 5, August 19 and September 10 of 1954, and on July 11, 1955.The album spent ten weeks at number 1 on the Billboard Top Pop Albums chart in 1956, the first rock and roll album ever to make it to the top of the charts, and the first million-selling album of that genre. In 2003, it was ranked number 56 on Rolling Stone magazine's list of the 500 greatest albums of all time. Elvis Presley was also one of three Presley albums to receive accolades in the reference book 1001 Albums You Must Hear Before You Die, the others being Elvis Is Back! and From Elvis in Memphis. It was certified Gold on November 1, 1966 and Platinum on August 8, 2011 by the Recording Industry Association of America.The original 1956 UK release called Rock n' Roll on HMV Catalog Number: CLP 1093 has six different tracks. Elvis Presley Lake is a lake in Lee County, Mississippi, United States. The lake is named for musician Elvis Presley, who was born in nearby Tupelo. Elvis Presley was an American entertainer who achieved initial success as a singer, expressing an early career goal of following in the footsteps of his role models James Dean and Marlon Brando to become a top dramatic actor. His manager Colonel Tom Parker's persistent lobbying of William Morris Agency president Abe Lastfogel for a Presley screen test paid off on March 26, 1956, when the singer auditioned at Paramount for a supporting role in The Rainmaker. Although not chosen for the part, he signed a contract with Paramount producer Hal Wallis on April 25 that also allowed him to make films with other studios.His feature debut was in Love Me Tender for 20th Century Fox, with the commercial success of the soundtrack EP being a bellwether for the next three Presley films. Loving You, Jailhouse Rock and King Creole were dramatic storylines written around Presley in the role of a musical entertainer. He would later state that King Creole was his favorite of all his films. Flaming Star and Wild in the Country were rarities in his career, non-musicals focused on dramatic storylines. According to music historian Peter Guralnick, the sluggish financial returns of those two films became the justification for ignoring Presley's wishes and limiting him to the more profitable musical format.. Ironically, it was a single shot of Flaming Star, when silkscreened by Andy Warhol which garnered, since 1998, more than a quarter of a billion dollars for auction houses and in private sales, most notably those entitled "Double Elvis" ( Sotheby's, 2012), Triple Elvis (Christie's 2014) and Eight Elvises ( private sale, 2008). In 1963, again ironically, as these silkscreens were being printed and shown at a Warhol exhibit in Los Angeles, Presley became bitter that his hopes for dramatic roles were not coming to fruition, stating that Clambake was his worst film. He began to complain about the deteriorating quality of the films and his belief that his manager's objectives were more monetary than anything else. At the expiration of all studio contracts, he returned to live entertaining. The two concert documentaries Elvis: That's the Way It Is in 1970 and Elvis on Tour in 1972 were the final theatrical releases for Presley. The singles discography of Elvis Presley began in 1954 with the release of his first commercial single, "That's All Right". Following his regional success on the Sun Records label, Presley was signed to RCA Records on November 20, 1955. Presley's first single with RCA, "Heartbreak Hotel", was a worldwide hit, reaching the No. 1 position in four countries and the top 10 many other countries. Other hit singles from the 1950s include "Hound Dog", "Don't Be Cruel", "Love Me Tender", Too Much", "All Shook Up", "(Let Me Be Your) Teddy Bear", "Jailhouse Rock", "Don't", "Hard Headed Woman" and "A Big Hunk o' Love". On March 24, 1958, Presley entered the United States Army at Memphis, Tennessee, and was stationed in Germany. He left active duty on March 5, 1960. Following his return to civilian life, Presley released his first new single, "Stuck on You", which was a No. 1 hit in the United States and reached the top 10 in ten other countries around the world. The follow-up single, "It's Now or Never", was another worldwide hit, peaking no lower than No. 2 in 13 countries. 1960 and 1961 saw the release of two more U.S. No. 1 hits, "Are You Lonesome Tonight" and "Surrender". Beginning in late 1961 the majority of Presley's singles were released to promote his films and their associated soundtrack albums. Hit singles from this period include "Can't Help Falling in Love", "Return to Sender", "Bossa Nova Baby" and "Kissin' Cousins". As Presley's success with singles from his movie soundtracks began to diminish in the late 1960s, he released "If I Can Dream", from his 1968 NBC-TV special, Elvis. The success of the song and television special brought about a resurgence of interest in Presley and his recordings, bringing him three top 10 hits in 1969, "In the Ghetto", "Suspicious Minds" and "Don't Cry Daddy". In the 1970s Presley’s chart success began to diminish slightly. He had only two U.S. top 10 singles in that decade: a live recording of "The Wonder of You" and "Burning Love". Other top 40 hits from the 1970s include "Kentucky Rain", "You Don't Have to Say You Love Me", "Separate Ways", "T-R-O-U-B-L-E", "Hurt", "Moody Blue" and "Way Down". Following Presley's death on August 16, 1977, new posthumous singles have been released in addition to many of his original singles being reissued around the world. 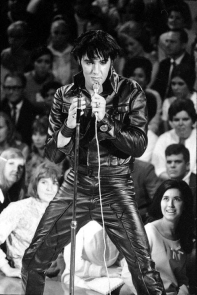 The first single to be issued following Presley's death was a live recording of "My Way", taken from the soundtrack of his final television special, Elvis in Concert. In 1978 another live recording was issued as a single, "Unchained Melody". In 2002, a remix of "A Little Less Conversation" by DJ Junkie XL was released to promote the compilation album ELV1S: 30 #1 Hits. It was a worldwide hit and returned Presley to the top 10 in many countries around the world. In 2003, a remix of "Rubberneckin' by DJ Paul Oakenfold was released to promote the compilation album ELVIS: 2nd to None. It reached the top 10 in a few countries, but overall was not as successful as its predecessor. Presley has 54 singles certified by the Recording Industry Association of America totaling 50 million in sales. The FBI Files on Elvis Presley consist of records kept by the Federal Bureau of Investigation concerning Elvis Presley. These records consist of 683 pages of copies of letters from members of the public commenting on his performances, newspaper clippings, and documents reporting that Presley was the target of extortion attempts. From Elvis Presley Boulevard, Memphis, Tennessee is the twenty-third studio album by American singer and musician Elvis Presley, released by RCA Records in May, 1976. It became Presley's fourth album to reach #1 on the Billboard country music album sales chart within the last four years. "Hurt" was a top 10 hit on both the country and adult contemporary charts, while "For the Heart" stalled at #45 on the country charts. The latter did make the pop top 30. Both songs would again find success on the country charts in the '80s – "For the Heart" became the first single for the Judds in 1983, while Juice Newton took her version of "Hurt" to #1 in 1986.From Elvis Presley Boulevard, Memphis, Tennessee was certified Gold on October 10, 1977 by the RIAA. Hitstory is compilation album by American singer and musician Elvis Presley, which includes the two previous compilation album ELV1S and 2nd to None, in addition to a bonus disc, entitled The Story Continues. On March 8, 2018, the box set was certified Platinum by the RIAA for sales in excess of 1,000,000 units. The tracks are not in any chronological order, but still derive from Presley's whole recording career. This is a list of the songs recorded by Elvis Presley between his first demos at the Sun Studios in 1953 and his final concert on June 26, 1977 at the Market Square Arena in Indianapolis, Indiana. The recorded date is the first known date. Album debut refers to each track's first appearance on LP. Many tracks had their first commercial release on singles or EP (extended play) releases, which are not noted; initial album releases occurred anywhere from a few weeks to decades after first single release. Generally, only the first RCA-licensed release is noted, as opposed to earlier release on unauthorized bootlegs. From the late 1960s through the 1970s, several songs were recorded only in concert with no known formal studio recordings. Of the multiple live versions released on various albums (either full or partially live albums), the LP debut of the first known concert recording is indicated. If a track was recorded both in the studio and in concert, the album debut of the studio version is indicated (even if a live version was released on LP prior to the studio version, as in the case of "Suspicious Minds", "Patch It Up", and others). Tracks re-recorded in the studio are generally not included (e.g. "Blue Suede Shoes", "Love Letters," etc.). Songs for which Elvis was only recorded singing a line or two (e.g. "Tiptoe Through the Tulips", "MacArthur Park", a 1968 rehearsal recording in which he sang one line of "Funny How Time Slips Away", etc.) are not included. Rumored recordings, or recordings believed to exist but that for whatever reason have yet to be made public (such as an alleged 1955 Louisiana Hayride performance of "Rock Around the Clock" and the long-rumored Sun Records recording of "Uncle Penn") are also not included. Love Me Tender is an EP by Elvis Presley, containing the four songs from the motion picture of the same name. It was released by RCA in November 1956. The EP peaked at #9 on Top Pop Albums chart with sales of over 600,000, as well as making it to #35 on the singles chart. It was simultaneously certified Gold and Platinum by the Recording Industry Association of America on March 27, 1992. "Love Me Tender" is a 1956 song recorded by Elvis Presley and published by Elvis Presley Music from the 20th Century Fox film of the same name. The words and music are credited to Ken Darby under the pseudonym "Vera Matson", the name of his wife, and Elvis Presley. The RCA Victor recording by Elvis Presley was no. 1 on both the Billboard and Cashbox charts in 1956. The song was adapted from the tune of "Aura Lee", a sentimental Civil War ballad. The song is also featured in many other films such as FM, Touched By Love, This is Elvis, Porky's Revenge, Wild at Heart, Die Hard 2, Honeymoon in Vegas, Backbeat, Gaudi Afternoon, Machine Gun Molly, The Princess Diaries 2: Royal Engagement, William Eggleston in the Real World, California Dreamin', Love in Space, Devil's Due, Just Before I Go, and 90 Minutes in Heaven. Loving You is the first soundtrack album by American rock and roll singer Elvis Presley. It was released by RCA Victor Records in mono, LPM 1515, in July 1957 to accompany his first starring film, Loving You (1957). Recording sessions took place on January 15, 16, 17, and 18, 1957, at the Paramount Pictures Scoring Stage, and on January 12, 13, 19, and February 23 and 24, 1957, at Radio Recorders in Hollywood. These are the first sessions where Steve Sholes is officially listed as producer. It spent ten weeks at No. 1 on the Billboard Top Pop Albums chart. It was certified Gold on April 9, 1968 by the Recording Industry Association of America. Elvis Presley had many close relationships throughout his career. The strongest of all the personal relationships of Elvis Presley, by far, was that he had with his mother Gladys, as described below. Promised Land is the twenty-first studio album by American singer and musician Elvis Presley, released by RCA Records on January 8, 1975. It was recorded in December 1973 at Stax Records studios in Memphis and released on Presley's 40th birthday in January, 1975. In the US the album reached number 47 on the Billboard Top 200 chart and number 1 in Billboard's Top Country LPs chart. The album rose to number 1 in the Country Cashbox albums chart. In the UK the album reached #21. The Essential Elvis Presley is a greatest hits collection by American rock and roll icon Elvis Presley. The album was released as a two-disc set on January 2, 2007 by RCA Records as a part of Sony BMG's The Essential series and was later released by RCA and Legacy Recordings as a Limited Edition 3.0 three-disc set. In the Netherlands the album was released as The Dutch Collection, which topped the albums chart in that country, while The Essential Elvis Presley topped the albums chart in Sweden. Although not as successful as other releases in The Essential series, the album was certified gold in three countries. In the U.S. it was certified Gold on 8/4/2010 and Platinum on 3/3/2016 by the RIAA. Welcome to My World is a compilation album by American singer and musician Elvis Presley, released by RCA Records in March 1977, five months before his death. The album was certified gold on September 30, 1977 and platinum on January 14, 1983 by the RIAA.